Playing the markets can be daunting for even the most seasoned investor. Chasing a profit in volatile trading conditions requires not just skill and nerve, but also the right tools. Swiss firm, Cornèr Bank Group brought its new trading product to The Bahamas just over a year ago and says island traders are seeing how the multifunctional platform, combined with a traditional private banking approach, can yield some very positive returns. CornèrTrader gives users direct access to the market— allowing them to trade currencies, stocks, options and futures through a number of channels including desktop, web and portable devices. But the product is much more than a stand alone trading tool, according to Cornèr Bank director Vittorio Cornaro (pictured, above), who says the level of support and personalized feedback that comes with the platform sets it apart from anything else on the market. “We are unique in what we are doing,” he says. “You have a lot of online trading players in the market that have excellent platforms, but they have a brokerage mentality where all they want to do is enroll more customers, hand them the username and password, and let them trade. The personal touch is important to Cornaro whose grandfather founded the bank in Lugano in 1952. He says the traditions of Swiss private banking—trust, integrity, consistency—are the driving force behind CornèrTrader, which blends all the benefits of modern technology with good, old-fashioned service. “You need to know who you are dealing with. You can find lots of brokers but, with most of them, if something happens you have no idea where your money is going to end up. We have a history of more than 60 years. We are very well recognized [in the industry]. It is not just a question of competing on price, but also showing that you can give something more and this is very much appreciated by our clients. They do not want to call a toll-free number and get put in a queue. We provide a personalized service,” says Cornaro. There are 32 staff in Cornèr Bank (Overseas) Ltd, the bank’s Bahamian operations, which began in 1996 with a staff of just three. 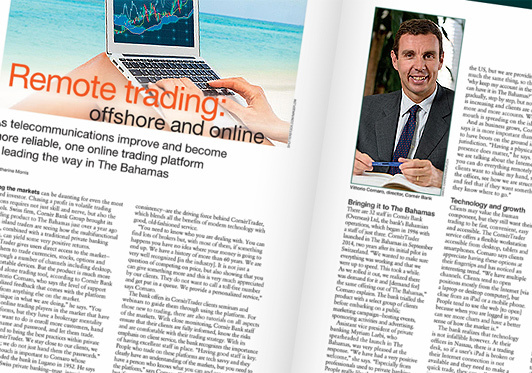 CornèrTrader launched in The Bahamas in September 2014, two years after its initial pilot in Switzerland. “We wanted to make sure everything was working and that we were up to speed. This took a while. As we rolled it out, we realized there was demand for it and [demand for] the same offering out of The Bahamas,” Cornaro explains. The bank trialled the product with a select group of clients before embarking on a public marketing campaign—hosting events, sponsoring activities and advertising. The bank realizes that technology is not infallible however. At their offices in Nassau, there is a trading desk, so if a user’s iPad is broken or their Internet connection is not available and they need to make a quick trade, they can call and get immediate assistance. With a product such as CornèrTrader, it is vital that the bank keeps up with technology and remains at the cutting edge of online banking. “Online trading is not new. It has been around from when the Internet started, but it has evolved. It has become more sophisticated. 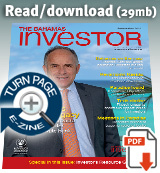 We monitor how the industry is moving. It is a constant effort to make sure we are up to speed,” says Cornaro.